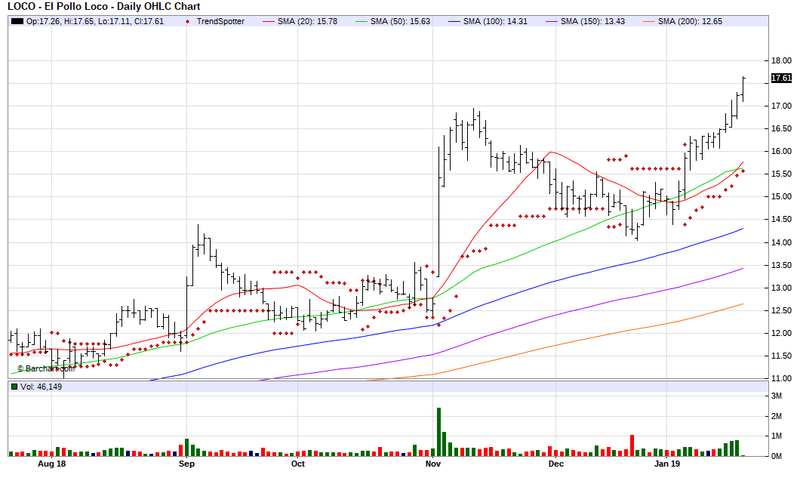 The Barchart Chart of the Day belongs to the Mexican chicken restaurant chain El Pollo Loco (LOCO). I found the stock by sorting Barchart's Top 100 Stockslist first by the most frequent number of new highs in the last month, then used the Flipchart feature to review the charts for consistent price appreciation. Since the Trend Spotter signaled a buy on 1/8 the stock gained 15.63%. El Pollo Loco Holdings, Inc., through its subsidiary, develops, franchises, licenses and operates quick-service restaurants under the name El Pollo Loco. The restaurants specializes in flame-grilled chicken in a variety of contemporary Mexican-influenced entrees, including specialty chicken burritos, chicken quesadillas, chicken tortilla soup, Pollo Bowls and Pollo Salads. El Pollo Loco Holdings, Inc. is headquartered in Costa Mesa, California.